The CSGI held a successful level 1 course based at Keefer Lake Lodge on April 3-13. Instructors were: Mike Hainult, Tyler Toews, Jason Martin, Ron Betts and Matt Devlin. There were a total of 19 course candidates hailing from various parts of the world including: Japan, England, Utah, the Yukon, B.C and Alberta. Many of the students are already working in the cat or heli industry as tail guides. The course started out cold, turned warm and ended windy and stormy which challenged the candidates at many levels especially on rope rescue day! Keefer Lake Lodge was a very nice venue for everyone to enjoy, their staff was super attentive, and the food was great. 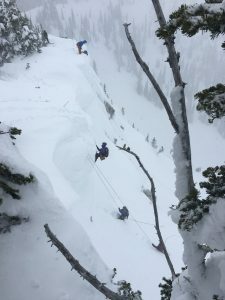 Most of the course utilized two snowcats with Keefer Lake in their terrain, and Kingfisher Heliskiing hosted one day of heliskiing close by Keefer Lake. Of the 19 students, 16 passed the course, 2 had a conditional pass requiring a retest in a hard skill, and 1 did not meet the level at this time. On behalf of all the instructors and the CSGI, we wish all the candidates the best of luck obtaining work in the mechanized skiing industry and further education in the mountain environment. Cheers and have a great summer!